My sixth stadium of 2014 was on Friday 18th April at Spotland Stadium in Rochdale, Greater Manchester. The match was Rochdale vs. Southend United in Football League Two. 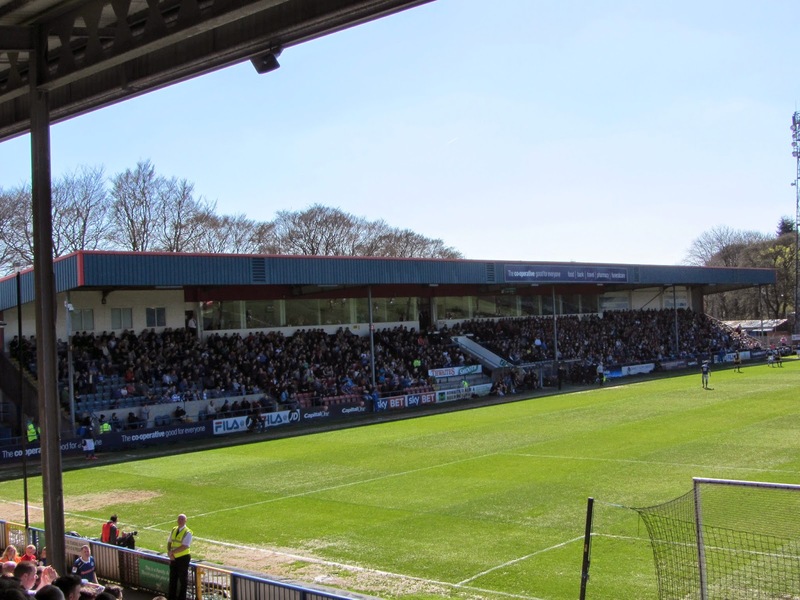 Spotland Stadium is north-west of Rochdale town centre bordering a park on one side and houses on the other three. The venue is 1.5 miles from Rochdale railway station and has been the venue for the club since 1920. The ground was extensively renovated in the during the 1990s into the early 2000s. The last stand to be completed was the Willbutts Lane Stand which is the largest in the ground. It has a capacity of close to 4,000 and is the only stand in the ground to offer unrestricted views throughout. Away fans are usually positioned in this stand towards the western end of the ground. Opposite this is the Main Stand which has around half the capacity of Wilbutts Lane Stand. The back of the stand is given over to the stadium hospitality areas and it also contains the dressing rooms, ticket office and club bar. The Pearl Street Stand sits behind the goal at the eastern end of the ground. It has 2,500 seats and though it has a couple of pillars holding up the roof the stand offers good views of the pitch as it was where I watched the game from. At the other end of the pitch is the only terracing section in the venue - the Sandy Lane End. 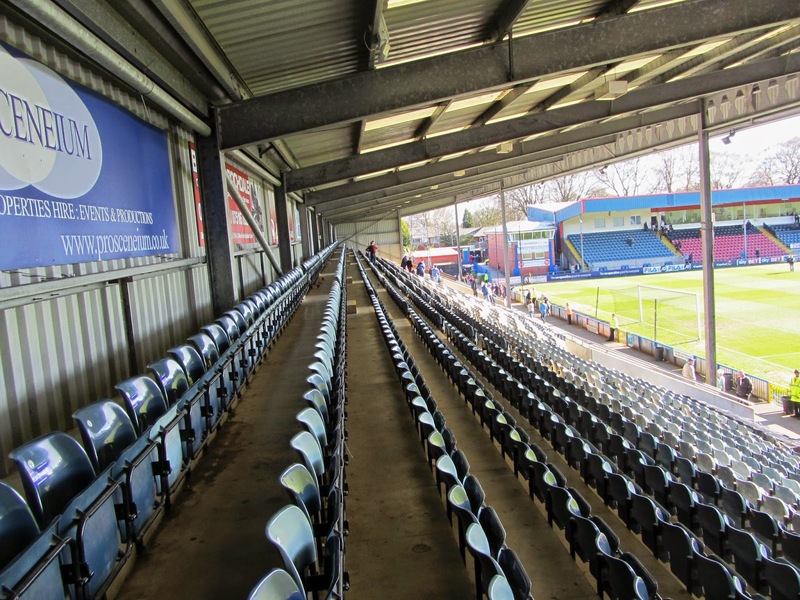 With trees and a road directly behind the stand it is the smallest at Spotland with room for just under 2,000 supporters. Again, this has a few supporting pillars across the stand. 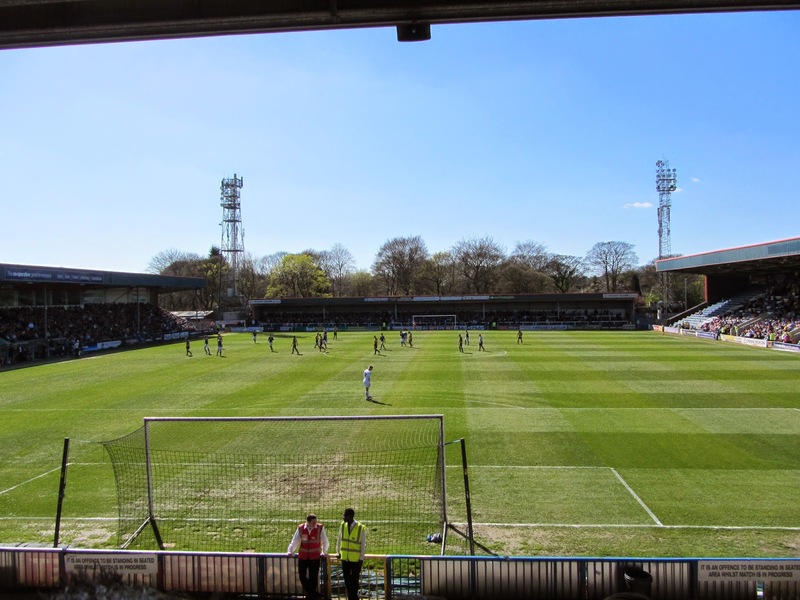 Rochdale were on their way to promotion but had hit a poor patch of form coming into the game - Southend were chasing the play-offs and were able to capitalise on a nervous home performance which saw them gift the visitors easy goals. The first came in the 12th minute when Matt Done was robbed of the ball by Jacob Murphy at the edge of the box - Murphy squared the ball to Barry Corry who tapped into the empty net. The home side reacted positively to going behind and almost equalised in the 18th minute when a long-range effort from Ian Henderson came back off the crossbar with Dan Bentley beaten in the Southend goal. The home side's wayward passing almost cost them a second goal soon afterwards when an underhit backpass allowed Michael Timlin in on goal but his effort was cleared off the line. Rochdale did not enjoy such good fortune just before the interval - a home corner was cleared and in the ensuing counter-attack Ryan Leonard crossed for Jacob Murphy to put the ball into the empty net. Any hopes of a comeback were extinguished after a woeful start to the second half saw Southend score within 20 seconds. Kevan Hurst beat a challenge in the box before finding the unmarked Timlin who steered the ball into the bottom of the net. This was the end of the game as a contest though Southend almost made it 4-0 when a stunning 30-yard shot from Kevan Hurst came back off the crossbar. Rochdale did manage to get the ball in the net near the end only to see the goal ruled out for offside - it summed up the day for the hosts who could have no complaints about the result having been soundly beaten by the play-off chasers.